No longer hidden behind closed doors, today’s cooks perform in the open in front of guests. Earning this year’s top prize, this airy Tuxedo kitchen was designed by the owners, Huntington Homes and Visions Kitchen Showcase to seamlessly combine practical food prep and cooking stations with entertaining. Inspired by Ina Garten’s “The Barefoot Contessa”—TV kitchen, the owners capture the feel using neutral colours, stylish lighting and soothing lines. They infuse their own style with touches of Asian flair found in the bamboo flooring, bold floral fabric and red accents. Guests get the best seat in the house by pulling up cozy high-backed chairs to the large island, the perfect spot for plating, conversations and nibbling. Every item in the kitchen has a special place: custom-sized cupboards built for cookbooks (half-depth by the refrigerator) and deep shelving to accomodate baking sheets. With a powerful gas stove, where all six burners are lit up during holidays, this is a kitchen that draws people together to create memorable meals. 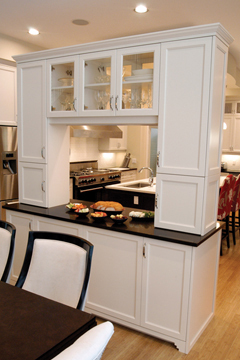 This freestanding china cabinet has extra counter space that double duties as a food and beverage service area. 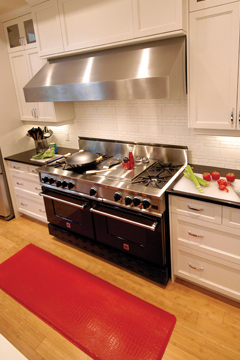 A mammoth Blue Star double oven gas range gets juices cooking. 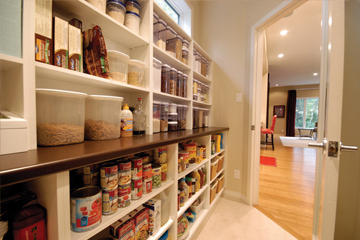 A well-organized walk-in pantry offers maximum storage for staples and small appliances.